Krasnoyarsk is the third largest city in Siberia (after Novosibirsk and Omsk) with 974,000 inhabitants, situated on both sides of the river Enissey. It was founded in 1628 and is now the industrial and cultural centre of the region. The main industry includes machine construction, chemical industry, shipyards and especially aluminium production. There are 2 universities, 15 colleges for higher education, 5 theatres, 4 concert halls and 6 museums. The construction of a first metro line of a 3-line network began in 1993. The first section from Vokzal'naya (Railway Station) to Vysotnaya was then scheduled to open in 2002 (5 km, 3 stations), with the two central stations with one transfer station to a future north-south line to open next. 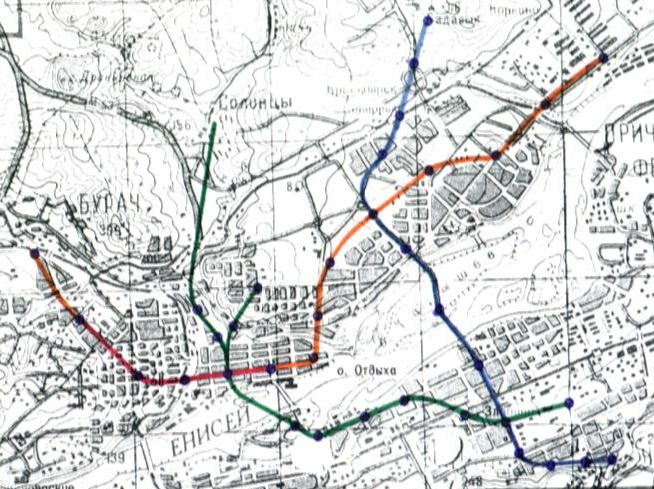 A further 8 stations were planned for a northwestern extension (to Korkino) and one more station to the northwest, Bugach. Construction was eventually suspended indefinitely. The second line was supposed to connect the city centre with residential areas on the south side of the river. To the north it was planned to split into two branches, the right one going into the historic centre and the left one north to Solontsy. The third line was not meant to cross the other two lines in the city centre, but the first line at Oktyabr'skaya and the second line in the southeast on the southern shore.